Eugene and his wife Dr. Vera Watanabe, were the founders of the Gifted Music School. He has helped to set a vision for the school and assemble a synergistic team of faculty, administrators, students and parents, and donors. As a music educator, Watanabe's students have gained acceptance to the top music schools in the country including Juilliard, Colburn, New England Conservatory, Cleveland, San Francisco, Peabody, and Manhattan. His students have been regularly recognized at national and international competitions. In 2017, the Dorothy Richard Starling Foundation has generously provided full tuition funding to 3 of Mr. Watanabe's outstanding students. International performance career as a violinist and pianist; frequent lecturer at universities and teacher's conferences. Performances with Moscow State Symphony Orchestra, Calgary Philharmonic, Hamburg Symphony, Saint Lawrence String Quartet, New Zealand String Quartet, New York String Orchestra at Kennedy Center and Carnegie Hall, Utah Symphony. Solo tours through Europe, Canada, and United States. Major awards at Honens International Competition, Kosciuzko Chopin Competition, Bachauer Young Artist Competition, two time MTNA National winner, Kingsville Competition. 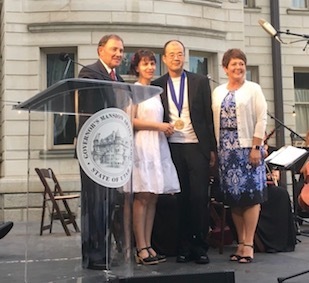 In 2017, Watanabe was awarded the Governor Mansion Artist Award for his work and service to the community.